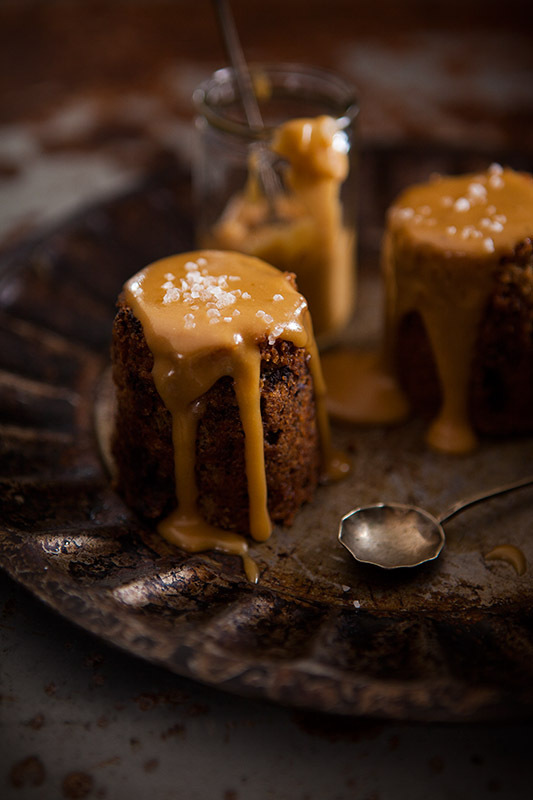 The Irish love a Sticky Toffee Pudding… although they think they do. It goes hand in hand with a well done steak in my snobby eyes. Here’s why, the majority of the time it’s a regular sponge with some toffee flavouring and a blob of processed toffee on top. Listen, it ain’t real unless there’s some wrinkled up dates thrown in there… You may not like the idea but your taste buds will thank you later. Seriously. This version isn’t very traditional, but that’s okay. I’ve got some bananas and chocolate added in there, so added with the Salted Toffee sauce i think this all goes down very well indeed. I think if you’re gonna go to all the effort (although it’s really not that much) its worth making them in the mini pudding tins. Not only are they practical but they look the bizz. If you’re in a panic about what to make for your Valentine tonight, then do yourself a favour, and make these bad boys. Your welcome! Preheat the oven to 180˚C. Grease 4 small pudding moulds and place them on a baking sheet. Begin by putting the dates with 100ml of water into a saucepan and cook over a medium heat until it begins to boil, then reduce the heat to simmer for around 10mins. When the water has reduced by half and the dates are very soft, take off of the heat. Remove the dates from the water and while still hot blend them with a hand blender until you have a smooth paste. Then, stir through the bicarbonate soda and set aside. In a large bowl, cream the butter and sugar with an electric hand mixer until light and pale. With a fork whisk the egg lightly until it’s blended together, then add this in parts to the sugar and butter, mixing after each addition until all is incorporated. Fold the flour, bananas, chocolate and dates into the pudding mixture until you have a smooth batter. Divide the mixture between the 4 pudding moulds and bake in the oven for 20-25 minutes. Check the puddings with a metal skewer to see if they are cooked through. Remove from the oven and allow to cool slightly before removing them from the moulds. Remove from moulds carefully, as it can be easy to do this sloppily and end up with half left in the mould. Im having that yeaaa, delish, got the dates from You so thanks.